Color(s): Any shade of gray or chocolate. White may appear as a blaze, or on tail tip, feet, and chest. Tan points may also occur. The bearded Collie is a breed of dog more popularly known as the "Beardie" other names for this breed include Highland Collie,Mountain Collie,Hairy Mou'ed Collie, & Argle Bargle. This breed is basically a herding breed but is quite popular as a companion dog these days, it is quite agile and falls in the medium size category of dogs. 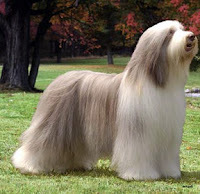 The bearded collie is genetically an ancestor of the Old English Sheep Dog. The beardie originated in Scotland and has been used for herding sheep and cattle for many centuries by Scottish shepherds. These are intelligent herding dogs and work as independent workers, this breed was known for making decisions about the cattle they herded without human guidance. This breed although still very popular, is rare in the United States and was saved from near extinction in 1944 when it was about to disappear as a breed. The average age of a bearded collie is between 11 and 13 years. It is a healthy dog that lives longer than other breeds of the same size. It is known to survive longer in Europe compared to the United States. The average litter size of the bearded collie dog breed is 7.